Enjoy the beauty of a mountaintop wedding at Heavenly Mountain Ski Resort. 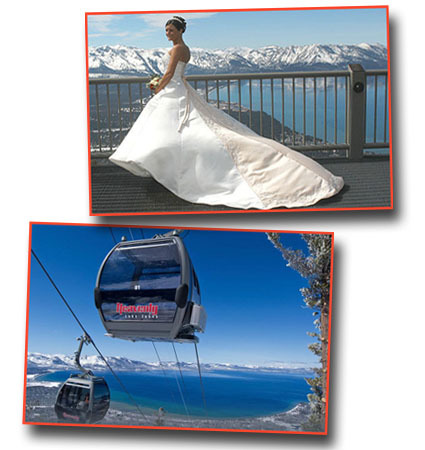 You’ll ride the Heavenly gondola to an altitude of 9,123 feet to the midway station Observation Deck where your ceremony will be conducted, an exhilarating overlook that consists of a panorama of beautiful Lake Tahoe and beyond. 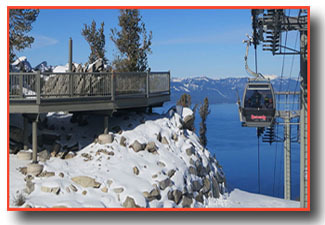 Beginning at the base of the mountain at Heavenly Village, the approximate 15 minute, 2 ½ mile gondola ride offers incredible sights of the largest alpine lake in North America and the surrounding Sierra Nevada Mountain Range. Upon arrival at the Observation Deck, you’ll traverse the walkway to an open spot on the platform. The vow and ring exchange will take place on an overhang that bestows a dreamlike ambiance, and the views to the horizons will have you feeling as though you’re on top of the world. With such a grand backdrop, the photography will deliver stunning results that will impart a lasting remembrance. After the ceremony is completed, the journey as newlyweds continues to the top of Heavenly. Once again, you’ll board the gondola and depart the midway station and travel up the mountainside to the summit. At your option, you can disembark at the pinnacle for a congratulatory toast at the mountaintop pub before returning to the base. Package includes four tickets – one each for the bride, groom, minister, and photographer. Additional tickets for guests can be obtained on the day of the wedding and will cost approximately $60 each (price is subject to change and may vary). Recommended for small groups of up to 15 people.